Wildlife-watching in Estes Park, Colorado, doesn’t have to entail a trip into the backcountry: you can run into plenty of “Cervus canadensis” in a drive through town. Ah, summer. Time for weekend drives and family vacations. Tourist towns all over the country are gearing up for an influx of visitors. But for one city in Colorado, it’s the elk that will be arriving in droves, in this warmest season. Much like the polar bears that annually travel through Churchill on their way to Hudson Bay’s frozen ice or the bison that often block the roads in Yellowstone, male elk must navigate their way through human developments in Estes Park, Colorado, every year, in search of nearby females. Unfortunately, there are those who think that just because animals wander into our cities, they are tame. Those people soon find out that—just as with the bison in Yellowstone that have a distinctive way of warning “stalkers” who come too close—it’s not wise to approach an elk with a camera. Watch the first, short video below which depicts a typical “elk jam” in Estes Park. In the second video, a man who didn’t keep his distance finds out that trying to get familiar with an elk should be by invitation only. Was just out there two weeks ago. Have been going there since 1964 so this isn’t new to me. But saw more animals in three days than I ever have in the past. Hundreds of elk, bighorn sheep, mule deer, coyotes, fox, 11 moose one day, even my first turkeys. Was great because I had someone very dear to me on her first visit there. We had a wonderful time. They are beautiful creatures, but gentle – No! – especially not if habituated to humans! I worked in a wildlife park with elk several years ago and the cows would get quite aggressive in the spring after calving. They can pound you into the ground with those hooves, though their threat display is enough to make most people back off away from the baby. The bulls would lower their antlers and paw at the ground after the velvet was rubbed off in the fall if anyone got too close. 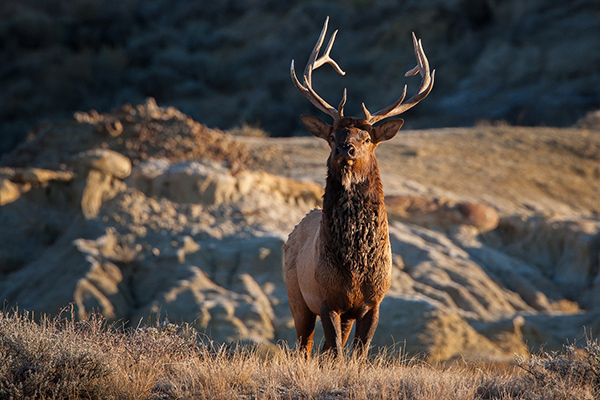 Elk are very large, strong animals to be respected! wow!!! These creatures are amazing to me, looking so gentle…but hmm… I got to work for the Menominee Park Zoo in Oshkosh, WI, and we would be right next to the elk, of course the male was always in another exhibit, but these animals have tremendous force! Thanks for the comment, David. Some of that footage may be from September, as you state, although — as mentioned by BBC One at the beginning of the video — the stags “invade” Estes Park from June to October. The video certainly is a good reminder to keep your distance! Great video, but it isn’t summer! It’s fall, and more like mid- to late September. You don’t see elk with shiny, sharp racks like that in Estes Park in summer. Nevertheless, too bad this video wasn’t able to capture the few people who do get gored because they don’t heed the warning. Though I must say it was funny to see that group of hunters (likely non-residents) get chased while in their camo. Probably the closest they got to an animal during the hunting season that they paid a handsome sum for. What a great video! It is amazing how dumb the “smartest” animal on the planet can be. Should be posted on all major news stations. great video. lucky it was an elk, rhino’s here in Assam don’t give mock charges! lol. I have been to Estes many times and I know the Elk are usually around but I seem to repel wildlife because I very rarely see them as well as most other wildlife. Hence why I stick to landscapes. I’ve seen this video before, it’s amazing what people do.